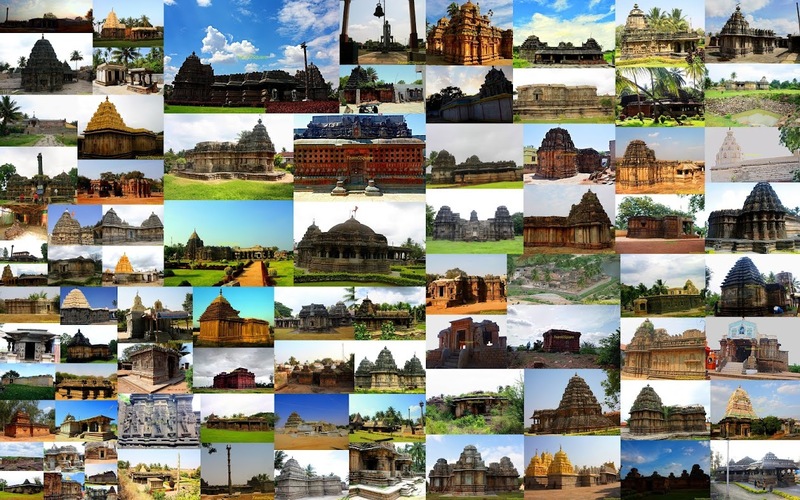 The regions of Madhugiri and Madakashira are home to many Forts, a few to name are the forts of Madhugiri, Channarayanadurga, Midigeshi, Madakashira, Bhasmangi, Ratnagiri, Gudibanda, and Pavagada. Last Sunday we were on a mission to explore any two of the unexplored forts amongst the above and one of those was Bhasmangi. 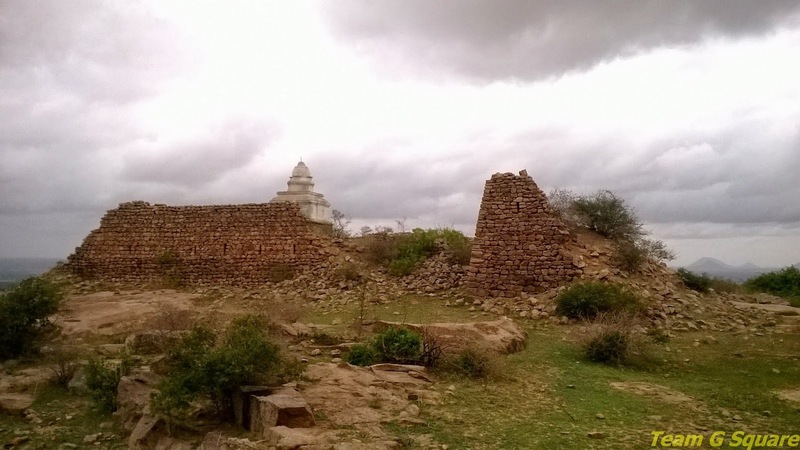 The Fort of Bhasmangi was built by Budi Basappa Nayaka around AD 1650 and was later captured by Hyder Ali in AD 1768. 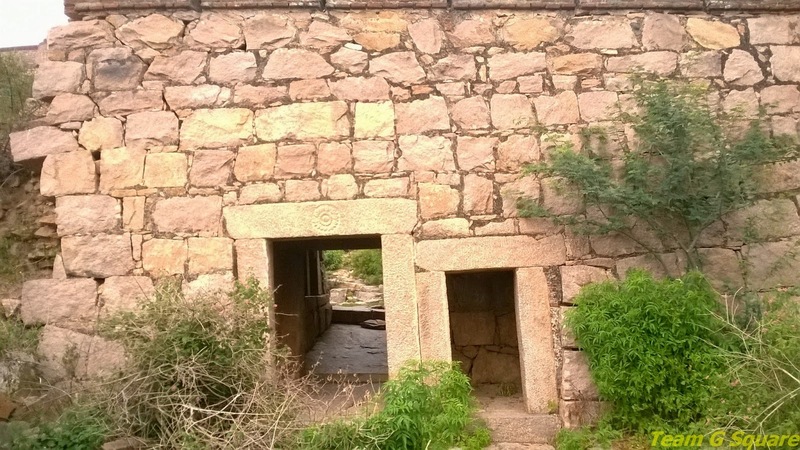 Hyder destroyed the old fort and built a new one which can be seen even now. 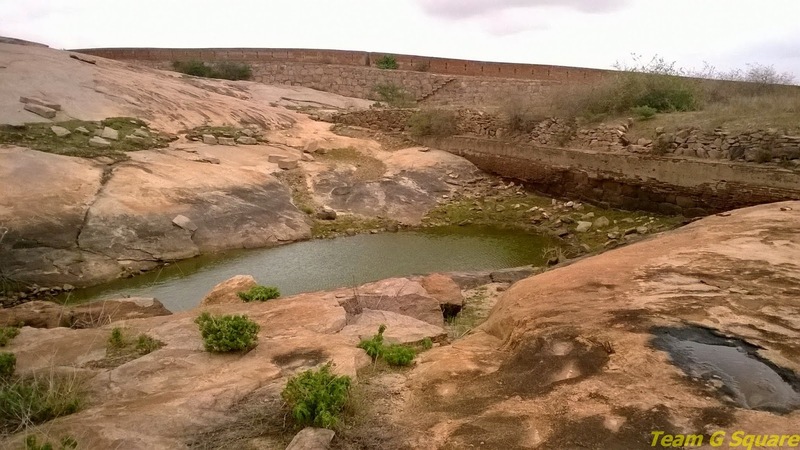 The fort is a perfect example of the Forts built by Hyder Ali and serves a great example in showing much importance given to rain water harvesting in those times. We left early that Sunday morning (around 5:00 am) so we could cover both the forts. 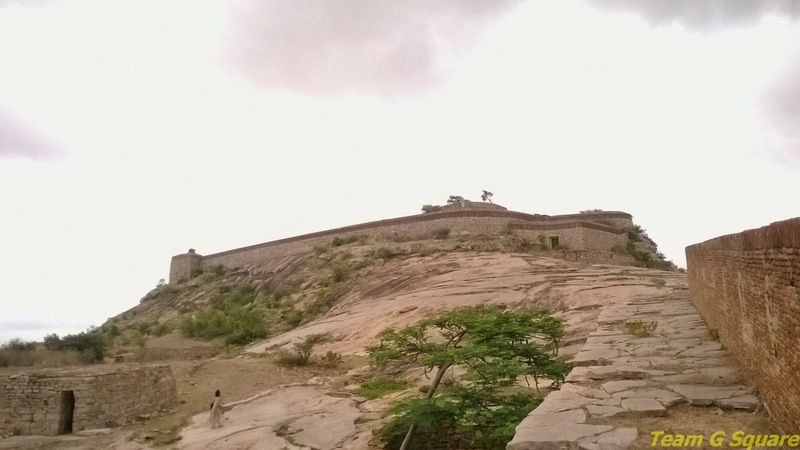 We started our ascent to this hill fort and in some time reached the first gate of the fort. We were amazed to see the magnificent fort standing tall in front of us. Every stone here stands to tell a story and the glory of the past. We sat down and had breakfast that we had packed. We then proceed further towards the second gate where we found a small temple dedicated to Lord Anjaneya. A few steps further lead us to a flat terrain which had a lot of ruins and water collecting ponds. Up above a small hill from here is a small temple dedicated to Nandi or Basavanna. 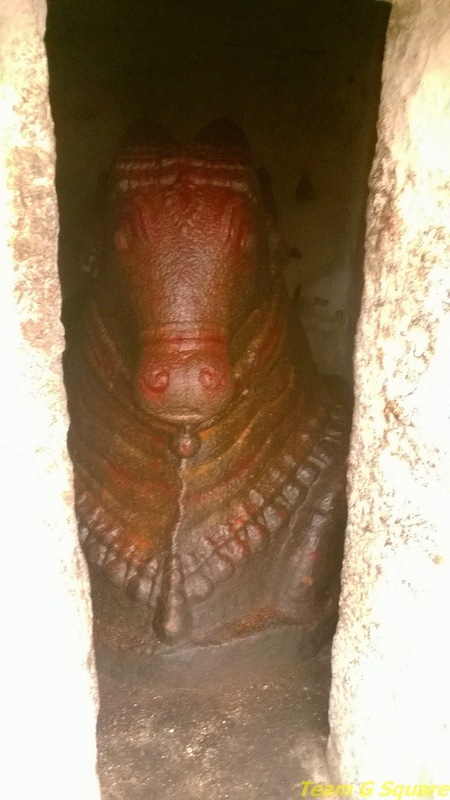 The idol of Nandi is big and beautiful. 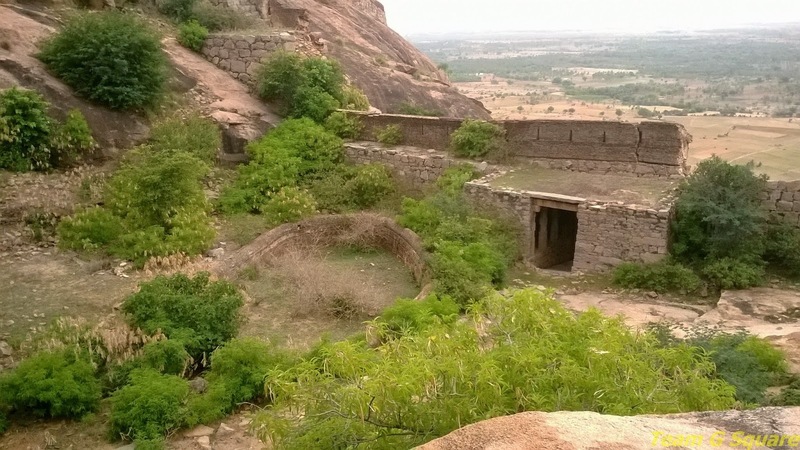 Continuing our climb up, we reached the last and the most intact tier of the fort comprising of many ruins and a doorway which probably lead to the location of the palace/ king's residence. The view from top was simply awesome. The descent was uneventful until we reached the first gate of the fort. Hereon, we took a simpler route to descend till we reached the roadway. 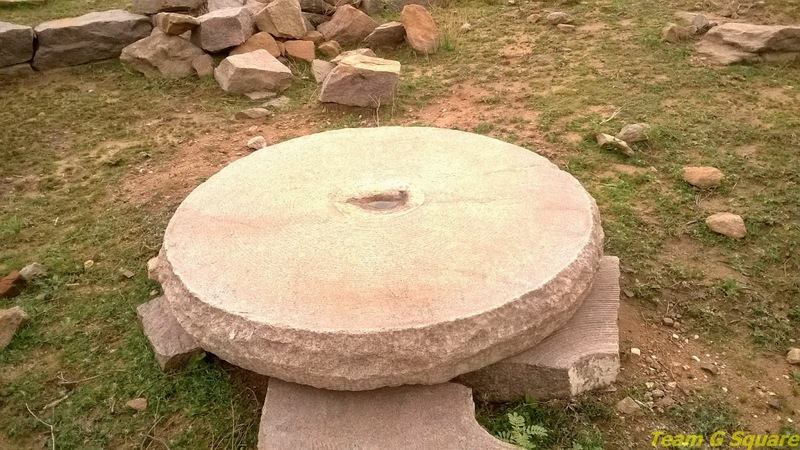 There was a temple dedicated to Lord Anjaneya just outside of the fort, which is now being taken care by two elderly people. Resting a while here, we moved on, getting prepared to explore the next fort of Ratnagiri. It was close to 11:30 am while we reached our vehicle and started driving towards Ratnagiri. A wonderful, fascinating post and beautiful captures for the day as always!! Thank you so much for sharing!! Hope your week is going well!! Oh my goodness, what an amazing area and so ancient looking with interesting things to discover! Wonderful shots! The views from this fort are fantastic. Thank you for taking us there with you. It was nice to see that much of the fort is in good condition. Wonderful fort. Should head there soon. Nice images! Fascinating place. Thank you for taking us along via your outstanding photographs. Beautiful experience right? Did I send you a book on Bhasmangi? Hey Sudhir. .ofcourse you did. .and thanks to you. .it surely helped us while exploring the fort. Haven't visited the place!! Thanks for sharing. And as always a nice post!! Wonderful exploration of these forts. Whoa! I am finding it hard to get the right words!!! I haven't seen any of these and I am feeling so terrible.